Here they are! Oh what a treat it is for me to share this work with you all. The month leading up to this moment is always intense, full of writing, and picture editing, and tweaking up and down the page. But when it is done, and I step back and let you read…? Such joy. Below are very brief descriptions with pictures, and the pictures are links to the full description of each retreat. Remember how much I like to write, each description is jam packed with details…! Slow Fashion returns for a third year with a new location and a couple new instructors, but the same general approach and subject matter. Will you join Cal Patch, Jessica Marquez, Liz Spencer, Amy DuFault, Katherine Ferrier, and me as we explore this dynamic world of sustainable clothing….? This year we’ll have the backdrop of Acadia National Park as our vista and inspiration, and the delightful campus of the College of the Atlantic as our temporary home. Come work with us? 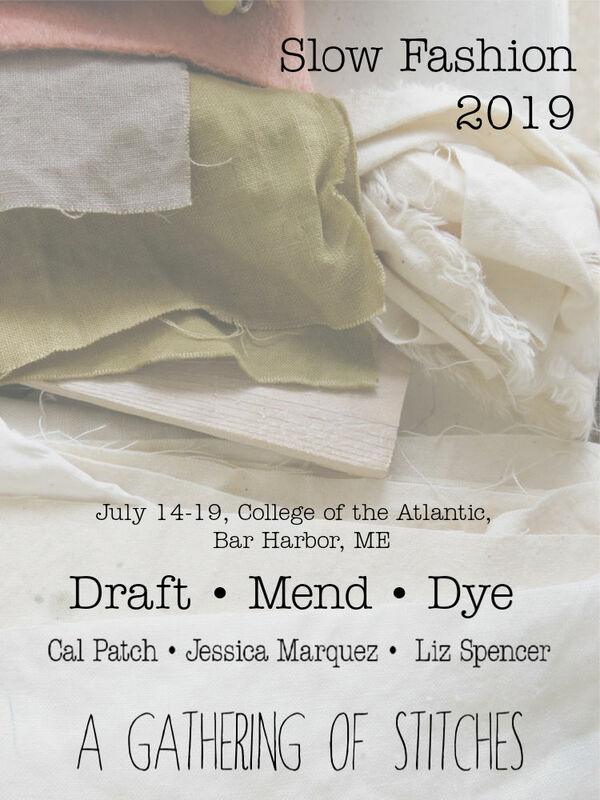 Slow Stitching returns as the Summer Camp of your dreams with Chawne Kimber, Tara Faughnan, and the return of Kim Eichler-Messmer! Stitch on the porch! Swim in the lake (great pond)! Fall asleep to the call of the Loons! Sew in the barn! It’s all here, for another dreamy year. Are you coming with us? There are just two retreats this year, because I have ideas for 2020, and they need to percolate a little more. But oh, how fun these two will be! All the details are there in the descriptions, which should give you lots to chew on for the next month. I will delay opening registration until the first week of March to give everyone time to think these over, confer with partners, spouses, children, parents, dogs, cats, bosses, the oracle, or whoever else might need to be be included in your decision making process. I think decisions like this shouldn’t be made under stress, but thoughtfully with all elements at hand. As in past years I will open registration up first to those who have attended before, and then to the full mailing list. If you are not on that newsletter list, you might want to sign-up now, as that is where all these announcements will first transpire. There is a link at the bottom of this page, or on the Contact page. Do not despair if you have not attended before, there is always room for newcomers, the ebb and flow of attendees works quite fluidly. Additionally, this year I will be offering a couple of scholarships to each retreat. The details for that process will go live in a day or two, along with my thinking behind the decision. If you have gotten this far without clicking through to the individual retreat pages I commend you for your commitment. I am honored by your attention, and I release you to go read, dream, plot, and, hopefully, Make…! Let’s meet in Maine this Summer….